One episode of The West Wing focuses on Take out the trash day, when the government dumps so much news onto the media that the bad stuff is lost amongst the sheer amount of information. Last week the Victorian government had its equivalent, when over 200 reports were released on a single day. 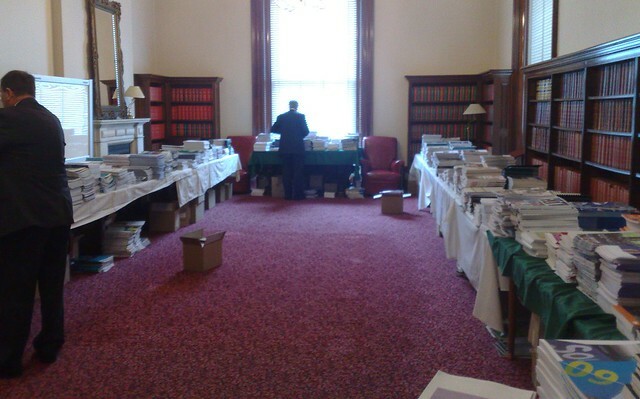 I went along to Parliament House to pick up a few for a little light reading. 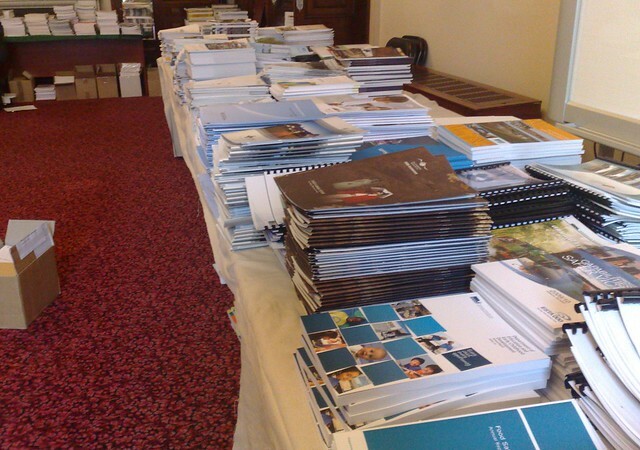 Here’s how it looked: basically a room full of glossy reports. They must be keeping the graphic design and printing industries afloat with all this stuff. It comes about because there’s a legal requirement for reports to be tabled while Parliament is sitting, and obviously after the June 30th end of financial year. Obviously though it means a heckuva lot of information to get through for the media, and although they try their best, you can bet some nuggets of information are getting lost in the tidal wave. The Opposition argues that if they get elected, they’ll change it so reports are released as they are completed, rather than in a big pile. That would appear to make sense. By the way, in a lot of cases, the reports are posted online by the relevant authority, so you don’t physically have to front-up to get a copy. For instance, those I grabbed to read on the train included: Department of Transport and Transport Ticketing Authority; V/Line; VicRoads. So far I haven’t found anything earthshattering that the media hasn’t already highlighted — but I was more looking for useful statistics for future use, some of which I have found. PS. Here’s one factoid for you: the Department of Transport (which doesn’t run any services itself) has 1241 full-time equivalent staff. It doesn’t look nice, but it’s democracy! the Department of Transport (which doesn’t run any services itself) has 1241 full-time equivalent staff. Yarra Trams, by comparison, employs 1180 tram drivers — people who actually do something for the travelling public. In fact they are all absolutely essential workers. Overheard on the Melbourne – Swan Hill service one day in August was the conductor loudly telling the buffet car chappie how he’d managed to earn (after tax) and with very little overtime (due to his ill wife who’d had heart surgery to repair a hole in her heart and support of his union rep) in 2009-2010 “Just over $60,000”. And how the staff hold ‘pub days’ every so many Saturdays which makes it difficult to roster staff on for shifts. I gets my info with my big ears lol. DoT, while apparently a major employer, also looks after such things like the Taxi Directorate and other such things (THEY could always do with more staff at the TD!). Still, when compared with Yarra Trams, it’s not very comforting!